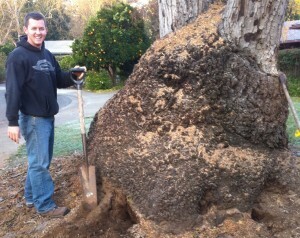 We are often asked what burls are and where they come from. A burl is simply a mutated growth that happens on a tree. Instead of growing normally, an abnormal growth forms on the side of the trunk or down where the trunk meets the root. While no one knows for certain why burls form, there are a few theories about it and you can learn more here . Some areas have a higher occurrence of burl growth, and some types of trees are more prone to burl formation. Southern Oregon and Northern California is an area that known for having more burl growth than other parts of the United States. There are many variations of burl wood and the resulting patterns in the wood. The most common is probably the pin burl. This type is a burl with many little “pins” that poke outward from the surface of the burl. This forms a pattern of “eyes” that can be seen in the cut burl wood. Other types of burl are swirl burl, which has a swirly pattern, and cat’s paw burl has a pattern resembling just that. Cluster burl grows above the ground, and there is also root burl which, obviously grows underground on the roots of the tree. Burls often grow large and can be several feet in length. This makes them ideal for creating larger pieces of furniture. Burl wood is also used as the foundation for sculptures and many other works of original art.